The Heart of Illinois United Way works to ensure that our children are ready to succeed when they enter kindergarten and people of all ages are prepared for work, postsecondary education and life. By preparing children to enter school and providing them ongoing resources throughout their education, they’ll be able to reach their academic and career potential. United Way funded education programs provide . . .
Children come to school with more than just their backpacks. They often bring along worries and anxieties. While the FamilyCore after school program at Lincoln K-8 in Peoria focuses on improving reading and math scores, the agency’s tutors also have the hard job of addressing the student’s social emotional needs. Working with students, teachers and family members, FamilyCore ensures these students are at the head of their class by providing an opportunity to build camaraderie with fellow students, and to strengthen social-emotional skills in a fun and safe environment. Poverty, preschool attendance, and parenting behaviors are important influences on school readiness. Children with higher levels of school readiness at age 5 are more successful in school, less likely to drop out, and more likely to earn more income as adults. Low-income children tend to be less ready for school due to lack of access to resources needed for healthy development, significant parental stress, residing in challenging neighborhoods or relocating often. The Heart of Illinois United Way invests more than $450,000 annually in early childhood education for low-income students and more than $200,000 in parenting education. From birth to age six, children’s brains develop rapidly and early learning is crucial for laying the groundwork for future academic success. Early childhood programs initiate cognitive and character-building skills, prepare students for Kindergarten, teach social-emotional skills, and begin to form a solid foundation of literacy and math skills. In addition, parental involvement is a critical predictor of student success and United Way is now asking funded programs to be intentional about engaging parents/guardians in their children’s education and measuring the impact. If you give $3 a week, you can provide a new book for every student in three preschool classes that includes educational activities for school and home. Early math skills are one of the greatest predictors of future academic success. With increasing focus on STEM education (science, technology, engineering and math), early childhood math is the first step to obtaining higher education and future employment. To support school readiness, the Heart of Illinois United Way Success By 6 program works with local preschool programs to equip educators and families with strategies that build mathematical thinking skills at a young age. Often, the most common approach to teaching early math skills is to focus on memorizing numbers alongside letters. However, learning to count by rote only teaches children number words and order, not number sense. That is why children at Tazewell Woodford Head Start are learning to sort and subitize (the ability to see a small amount and know how many there are without counting). The ability to subitize at a young age can lead to a better understanding of adding and subtracting; and children build scientific inquiry skills when they sort, compare, describe, and put things in order. Healthy parent involvement is critical for child development and success in school. In programs funded by the Heart of Illinois United Way, at-risk parents benefit from one-on-one interventions, parenting classes, and support to strengthen parenting skills that are vital to healthy relationships and children’s success. If you give $3 a week, you can provide four weeks of intensive in-home visits and parenting education to first-time, at-risk parents to reduce child abuse/neglect and promote healthy childhood development. The Heart of Illinois United Way funds early childhood, mentoring, tutoring, afterschool and in-school counseling programs? All of these provide the support needed to achieve graduation. These students from Quest Charter Academy benefit from a grant from our S3 (Supporting Student Success) initiative that provides counseling services, professional development for teachers, and an anger management program for students. For a complete list of United Way Funded Education-Related programs, click here. Students participating in after-school programs have better school attendance, improve their reading and math grades, and are more likely to graduate. Youth who have mentors possess higher self-esteem and confidence which leads to healthier relationships, better attitudes toward school, and higher rates of college enrollment. The Heart of Illinois United Way invests more than $740,000 annually in after-school and mentoring programs for children and youth. These after-school and mentoring programs improve attendance and school engagement, academic success, and graduation rates. They also improve social-emotional skills and decrease the likelihood of engagement in risky behaviors, such as drug/alcohol use and behavioral incidents. If you give $20 a week, you can provide a semester of after-school tutoring for an at-risk student. 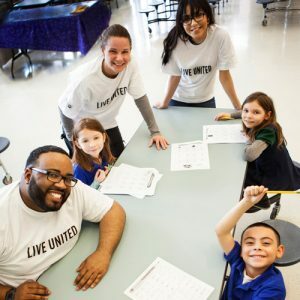 The Heart of Illinois United Way funds two special initiatives under the Education Impact Area – Success By 6® and S3 (Supporting Student Success). Our Success By 6 program focuses on preparing pre-school children to be ready for academic success when they enter kindergarten. Our S3 initiative is a collaboration between public schools in Peoria and Tazewell counties and United Way partner agencies. S3 focuses on improving academic achievement by providing in-school counseling and group support for substance abuse, violence prevention and mental health. To see United Way funded education programs at work visit our YouTube channel.